A one-night-only art festival that unfolded all over Roppongi, one of Tokyo’s premier districts for the city’s night owls. Roppongi Art Night 2010 (hereafter referred to as Art Night), a one-night-only art festival staged in the Roppongi area, was held from 10:00 on March 27th (Sat) until 18:00 on March 28th (Sun). The festival was organized by the Tokyo Metropolitan Government, the Office of Tokyo Culture Creation Project, and the Roppongi Art Night Executive Committee (comprising The National Art Center, Tokyo, the Suntory Museum of Art, Tokyo Midtown, 21_21 Design Sight, the Mori Art Museum, Mori Building and the Roppongi Shopping Street Association). The chairman of the committee was Fumio Nanjo, director of the Mori Art Museum, with Tadao Ando and Yoshiko Mori serving as special advisers. The theme for this second edition of the Art Night was “dream city”. Roppongi has long been known for its vibrant nightlife, but it is also home to four prominent museums – the Mori Art Museum, the Suntory Museum of Art, The National Art Center, Tokyo, and 21_21 Design Sight – as well as a host of galleries and other art-related institutions and facilities. Many of these establishments, ordinarily closed to the public at night, opened their doors to visitors for one night only. Local bars, restaurants and cafés also participated, giving Roppongi an extra burst of vitality during the festival. Various events and performances were held at numerous venues throughout Roppongi during the “core time” from sunset on the 27th (17:58) until sunrise on the 28th (5:32). The jam-packed program featured up to 50 events happening simultaneously at different locations, resulting in more than a few harried visitors anxiously raring to catch everything they wanted to see. The following is a description of just some of these events. One of the highlights was artist Noboru Tsubaki’s new installation “Before Flower”, which made its appearance in the Roppongi Hills Arena just as the sun was beginning to go down. 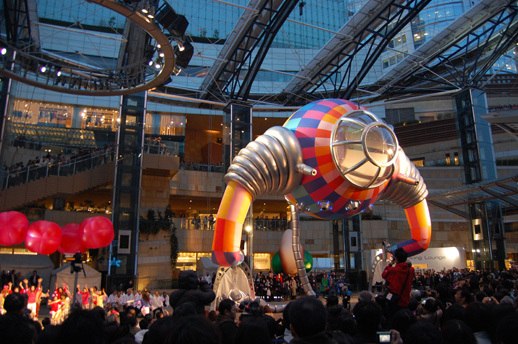 Tsubaki is known for a body of work that conveys social messages with a strong visual impact, including a giant 50 meter long locust that created a sensation at the Yokohama Triennale international art exhibition in 2001 (part of the “Insect World” project developed in collaboration with Hisashi Muroi). The title “Before Flower” refers to the seed-bearing gymnosperms that are thought to be early ancestors of life on Earth. Sensors attached to the ends of the claws of “Mother Night”, the main work in the installation that was modeled after a gymnosperm, detected the presence of carbon dioxide in the air, causing the image on the orb-like central screen to change. Although the work was inspired by primitive plant forms, there was also a whiff of the not-too-distant future in the way this gigantic 13 meter tall structure reared up to its full height, causing a stir in the excited audience. All at once, the venue erupted into a festival-like atmosphere. 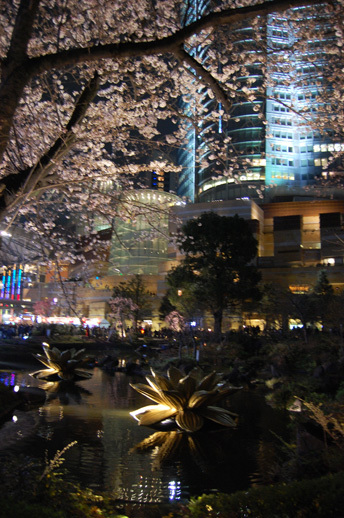 Scattered in various locations throughout Roppongi were also some 15,000 pink spore-like balls that had supposedly been released by the two gymnosperms Argos and Urmos. As the sun set and darkness fell, Roppongi grew even livelier, teeming with people reaching out to touch the sparkling lit-up spores. Just at that moment, a performance by dancer-choreographer Masako Yasumoto and musician Oorutaichi was getting started at The National Art Center. The seating area was completely packed with excited viewers who had come specifically to catch this show by two extremely popular performers. With extra crowds thronging the surrounding area, most people could not even see the performers themselves. Viewers who had claimed a spot on the second and third floor stairwells and even the top of the elevators stood entranced by the energy and dynamism of the performance. As the sky turned completely dark, the French street performance group Compagnie des Quidams kicked off their stunning showpiece “Rêve d’Herbert”, a phantasmagoric spectacle featuring a host of giant furry figures that gave off a white glow. 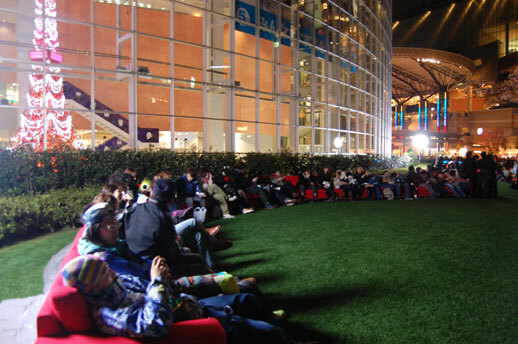 Crowds had started gathering on the lawn of Tokyo Midtown in eager anticipation even before Compagnie des Quidams were due to appear. 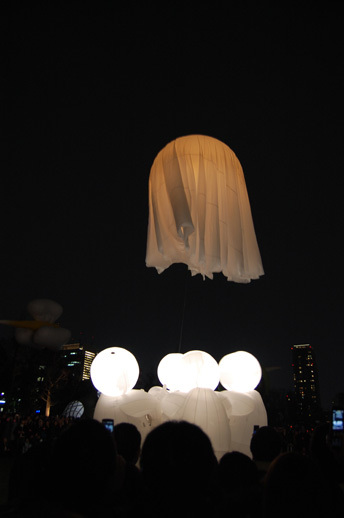 When the giant white figures arrived, many people followed behind them, drawn into a mysterious performance set against the night sky. For the adults it was a somewhat romantic experience, but some kids were frightened by the spectacular sight and burst out crying. It was as if a positively unreal, dream-like world had swooped down and landed in the middle of Roppongi. 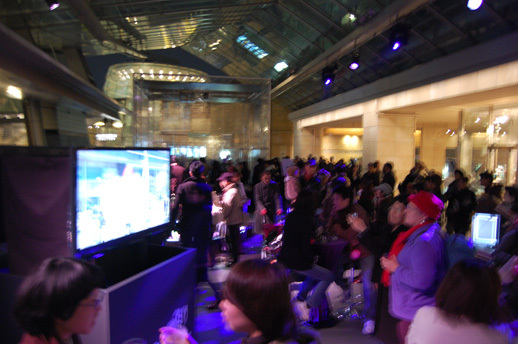 Another big draw was the fact that the Mori Art Museum and 21_21 Design Sight had decided to remain all night long. In addition, there were several discounts and perks that no doubt attracted a large number of people who would otherwise rarely set foot in a museum: the National Art Center, Tokyo offered free entry to its “Artist File 2010” Exhibition (only on the 27th), while the Mori welcomed visitors for only ¥500 from midnight on the 27th to 6:00 the next morning. Peak crowds at the Mori formed lines with waiting times of more than 30 minutes – a huge surge of visitors rarely seen at a contemporary art exhibition. 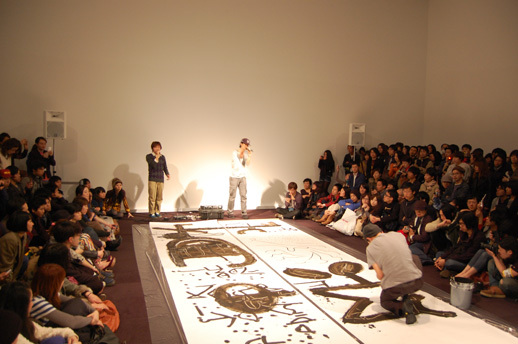 Two special nighttime events were held as part of the ongoing exhibition at the Mori Art Museum entitled “Roppongi Crossing 2010: Can There Be Art?” One was a live painting demonstration by exhibiting artist Hiraku Suzuki, featuring the US-based Shing02 as MC. Visitors flocked around the large canvas that had been prepared and watched Suzuki’s spirited movements with bated breath. 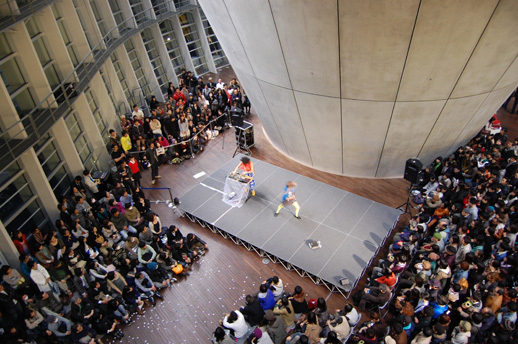 The other event was a collaborative performance by UJINO and contact Gonzo, both of whom also had works featured at Roppongi Crossing. Both events were wildly popular, causing long lines to form and disappointed visitors that had to be turned away after arriving just before the starting time. 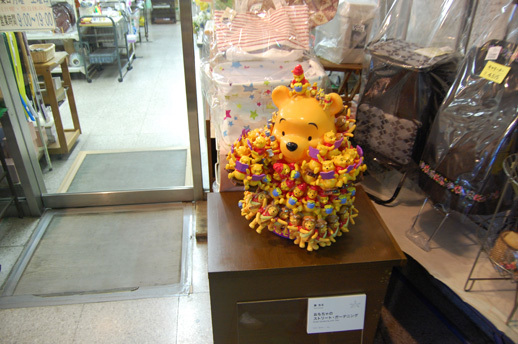 The “Roppongi Achi-Kochi Project”, on the other hand, was held in the streets, featuring works by 3 artists installed in shop windows and entrances and under trees. Like an orienteering exercise, participants used the landmarks indicated on their map in order to track down the works on display, excitedly gathering in front of the artworks they had discovered in order to take commemorative photos. In the Mohri Garden, the petals of Choi Jeong Hwa’s “Lotus”, an installation of giant water lilies floating on the surface of the pond, yawned open and shriveled shut, while visitors sat on a long sofa just next to it designed by the Danish interior brand BoConcept, set against the extraordinarily picturesque sight of cherry blossoms in half bloom illuminated at night. With the festival in full swing at two in the morning, a group of people started to gather next to Tsubaki’s “Mother Night” at the Roppongi Hills Arena after hearing that the artist was up to something. In fact, Tsubaki was about to unveil for the first time in Japan his work “Moon Walker” – a “mobile suit” capable of walking as if subjected to the same amount of gravity on the moon. However, because the performance had trouble getting started even 20 minutes after the scheduled time, the huge audience of expectant people started clapping their hands. Apparently, the wind that night was too strong, and the balloon attached to the robot kept getting buffeted around. Although the organizers waited a while to see if the wind would die down, the floating moonwalk performance had to be unfortunately abandoned in the end for safety reasons. Looking forward to its revenge! At the back of the Arena, Yotta Groove’s flashy decorated car pulled up and started selling roasted sweet potatoes. In the crisp night air, many visitors were no doubt just starting to feel peckish, and the yaki-imo sold like hot cakes. Enveloped in a purple mist, the lounge area stocked with drinks from sponsor companies was also doing a roaring business, making this a perfect night out on the town for the adults. Free shuttle buses, extended subway operating hours and free parking all helped to improve late-night public transportation and access. As the Art Night wore on, venues all over Roppongi continued to be packed with sleepless visitors until dawn, with something or other always going on somewhere. With only one weary body to navigate all that the festival had to offer (and too little space), this writer was unfortunately unable to introduce readers to everything on the program. 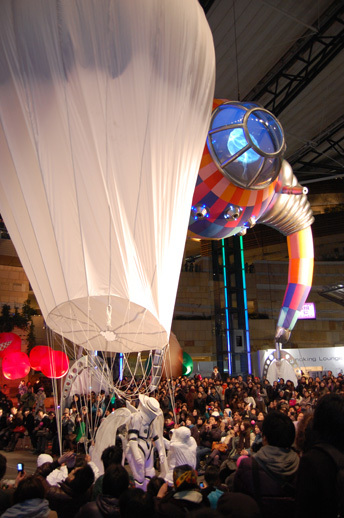 Despite temperatures falling to a low of around 5℃, the turnout of more than 700,000 people was proof of the Japanese public’s high level of interest in art, as well as their predilection for a good carnival-like atmosphere (this, combined with the cosmopolitan nature of Roppongi, ensured a large number of foreign visitors as well). More than anything, however, this was an event where people could come together because of art, enjoy getting caught up in a night of fun, and forget about the recession and other social problems. I hope Art Night ends up being not just a one-night dream, but rather a testament to the collective energy of Tokyo as it continues to shrug off the recession. There was definitely something about the whole affair that gave me that impression – my exhaustion at the end of a long night, as the first rays of dawn appeared, felt on the contrary like a burst of unexpected energy.